-i go to church most of the time, give money to the church, and sometimes even pray and read my bible. these are some of the things people mean when they say that they are a Christian, but more often than not these things have almost nothing to do with actually following Jesus. following Jesus is about doing like he did. it is about walking in his footsteps. it is about trying to live the way he lived, which was less about beliefs and religious routines than it was about good news for everyone, loving the unlovable, and pushing against the powers and principalities in order to bring justice for all. following Jesus isn't a label. it certainly isn't a political party or a birthright or a part-time hobby. in matthew 9:9-13, we read the story of how Jesus called matthew. it is a fascinating story told from matthew's own perspective. he was a tax collector, standing at his tax collector booth, which is to say he was at work, recognizable as a tax collector, when Jesus walked up to him, and invited him to follow him. let's make a couple of important observations for you and i in this remarkable story. first, you need to remember that tax collectors were the very worst. they were the worst of the worst. think about the worst sinner you can think of, and whatever that is, substitute the words "tax collector" in their place, because that is how they were viewed in first century palestine. they weren't just greedy, they were greedy traitors, who had turned their back on family and friends, community, nation, and God. they were lower than scum. they were completely isolated and cutoff from the complex web of relationships that shaped the community. they were out. but not to Jesus. Jesus walked right up to Matthew and said, "you're in." it wasn't like Jesus didn't realize what Matthew actually was: he was standing in his tax collecting booth! Jesus was very much aware of what he was doing, and he was making a clear and deliberate statement about what kind of person it takes to follow him. he talks about it a few verses later when he says that it is the sick who need a doctor, not the healthy. Jesus is looking for tax collectors and sinners and disasters and broken messes and train wrecks and failures and addicts and junkies and cheaters and thieves. in other words, he is looking for us, once we are ready to admit that are the broken ones. -"matthew, you disgust me. get away from me." -"matthew, you are a disaster, but if you get your self cleaned up and get your junk together, you could follow me." -"matthew, you are a trainwreck of a human being, but i love you anyway." -"matthew, if you would just confess with your mouth and believe in your heart that i am the son of God, then you could follow me." in that pregnant moment, that shocking, breathtakingly stunning moment, matthew made a decision. he decided to see what this was all about. he decided to hitch his wagon to this young radical rabbi with the rugged group of ragamuffin followers. he didn't recite any creeds. he didn't pray a sinners prayer. he didn't change clothes or make a public statement. he simply took a step and followed Jesus. in that pregnant moment, matthew became a Jesus-follower. 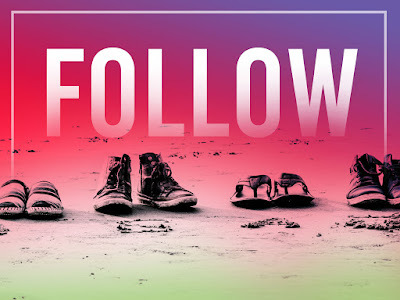 so here's the question for me: am i following Jesus? or am i content to hide behind the label of being a Christian? have i come to believe the lie that i am too big of a sinner to follow Jesus? have i bought into the myth that only the religious can really be Christ-followers? or, worse, have i lied to myself in order to believe that i am not broken at all, and that all i really need is to go to church sometimes and write a check or believe the right things? because those are all lies. the truth is that Jesus walks right up to me in the middle of my brokenness and says, "follow me." and i am left in that pregnant moment to decide what will be born in me. religion? or a relationship based on walking in his footsteps, wherever Love leads?